The speculation over Conor Chaplin’s future continues to create debate among Pompey fans. Here's a selection of those views at portsmouth.co.uk and The News’ Pompey Facebook page. Here's a selection of those views from portsmouth.co.uk and The News’ Pompey Facebook page. I don’t think he is good enough at this level yet and if he is not a regular he will go at the end of the season anyway. If we can get a good price and a sell-on clause it would be better for him and us. We need more than potential, and his record over 90 minutes has been poor, and the lower leagues are full of players that had great potential. I think at Chaplin's age a player's potential is measured by actual ability. I agree he has not shown his full ability yet but has in flashes. I believe these 'flashes' are a hint of his true ability and needs to be given a chance to show that by playing in a team that would enhance that ability. If you have good players you build your team around them to bring out the best in what you have got at your disposal. Coventry have just sold a good player and they want to replace him with a good player. They think Chaplin fills the bill, why don't we? Clarke apart - Chaplin is the best prospect we have had on our books since Matt Ritchie. We must NOT make the same mistake again. Why the need to get a decent striker when we have one right here in Conor?! Pompey have made this mistake so many times and lived to regret it. Sending Chaplin to Coventry will come back to haunt us when he strikes again at Fratton Park! (And he WILL.They ALL do!). 500k plus add-ons plus 20 per cent sell-on fee, and I’ll drive him there myself. 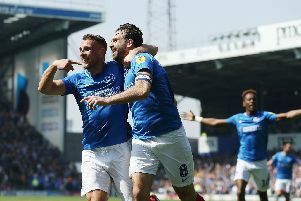 Such pressure, to prove himself he has to do what only one other Pompey striker has done since Todorov 16 years ago and score 20 plus goals a season. All of the current youngsters have taken a fair bit of flak on this forum when given a decent run in the team. It seems everyone wants the youngsters to succeed except when the results are not going the right way - then everyone wants experience. You can't have it both ways.